The ultimate guide to your personal brand isn’t only about a job search; it’s about you at work. How do you figure out your personal brand and more importantly, how do you get more people to like, trust and buy from you? What are you known for? How do people describe you when you’re not there? When do your colleagues come looking specifically for your help? These are the things that inform and compose your brand. You can think of your brand as a combination of your personal values and philosophy, your attitude and visible attributes, as well as your skills, experience, and education. It’s a measure of reputation that emerges from your experience. It also allows you to differentiate yourself by being able to consistently articulate and leverage your unique value. To help you establish and understand the concept of personal branding, I sat down with Mark Lack, who discusses the importance of a personal brand and also the step-by-step process to build one when you have zero followers. Mark Lack is the best-selling author of Shorten The Gap and TV host of Business Rockstars where he has interviewed over 1,000 successful entrepreneurs ranging from millionaires to billionaires. INC Magazine ranks Mark Lack as one of the Top Personal Branding Experts to Follow. Mark speaks around the country and helps businesses and entrepreneurs grow their income, impact and influence through sales, marketing and the power of personal branding. Question: Can you share your story and tell us about what you do exactly? Answer: We help people with personal brands. We help people become more known and get other people to like them, trust them, and scale. I have come to realize that the most well-known people are usually the most successful. Our financial success is usually in some proportion to the amount of people who know us, like us and trust us. Personal branding in its simplest form is to get people to know you, like you and trust. You help people overcome a problem and reach a goal and a result. But they’re not at their goal yet. You bridge the gap. You get them to the results they want. And you do that at scale by presenting yourself as an influencer, a trusted advisor, etc. That’s what we help people do. We help them impact people and as a result, make more money and add other revenue streams. Question: Why do you think it’s important to build a personal brand? Answer: I think that personal brands have always been there but more as a celebrity. Before 2017 and 2018, and this trend of online influencers, it was really just celebrities and entertainers that had personal brands. We didn’t even call them that. They were just celebrities. Now personal brands are really prominent. An online influencer is someone who has strong personal brand that gets people to like them and trust them. Personal branding is so important for everyone. If you’re looking for a job, 80% of hiring managers go on and look at your social media before hiring you. They want to see the real person outside of the interview. If you’re trying to start your own business or you already have a strong business, personal branding can work for you. 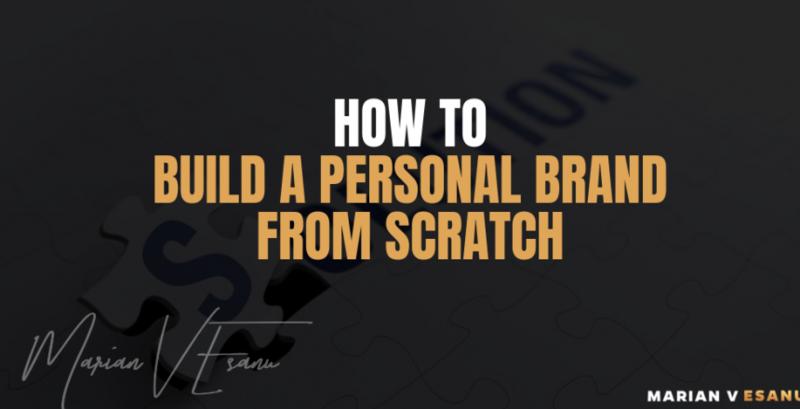 You already have a personal brand on your own, and now it’s just about bringing that out and making it work for you. In the future, the average low paying job will be replaced by robots and if you don’t have a strong personal brand that shows why you can’t be replaced, then you might be in trouble. So personal branding is so important for both growth and survival in today’s competitive market. Question: At what stage in someone’s business should they be working on their personal branding? Answer: You should have started yesterday, or many years ago. I wish I had known then what I know now. How it maximizes your happiness, your fulfillment, and helps ensure your financial security. The best time to start is as soon as possible. Start now. Start today. Question: If you transition from one career to a whole different one, how do you handle this with personal branding? Answer: If I’ve built a personal brand as the real estate guy and everyone follows me because I’m the real estate guy. What happens when I make a change and now I’m a social media marketing agency? It’s completely different! Some people build personal brands to be the go to person for their space. But then making a transition becomes an issue. But if you build a personal brand that embodies what you stand for and your “why,” then transitioning your career or your space is no longer a hurdle. So make it about you, what you stand for, and what your value is, versus doing it for your particular space. Be more so you can give more, so you can do more, and have more. Question: If someone is just starting out, from zero, what are things they should do when reaching out to influencers? Answer: These people get reached out to a thousand times. You can tell them how inspirational they are and the impact they’ve had on you. But, they’ve heard this a million times. So above all else, find a way to invest in them. If there’s a workshop, a gala, a book, etc, that’s in their wheelhouse and you can get involved, then do that! If you buy ten copies of someone’s books and send them a picture of the books, they might share that with people because you’re supporting them. It shows them proof that you’re serious. To ask for something when they already give out thousands of hours of content for free just won’t work. You need to differentiate yourself. The second thing is then take the content that you learned about when investing in this influencer, and create something that would also resonate with their audience. You can then boost it on Facebook and reach hundreds of thousands of people. You can then go back to that influencer and ask them for an interview and show them that it will be shown to hundreds of thousands of people. The bottom line is invest in them. Pay for their products and show them the value they would be getting by working with you. Question: How can you monetize your brand? Answer: This is the inevitable progression. One thing you absolutely must do is you have to engage. When people are liking and sharing, you need to go on and thank them for all their actions. This allows you start building a relationship and the odds of continuing that relationship increase. They may end up wanting to work with you down the road because of the work you put in to building that relationship. After that, you want to make sure that you keep track of the people you have been engaging with. So when you have something to offer, you can take them up the ladder and tell them about different things they may be interested in taking part of. It could be a webinar or a private community to make them feel more exclusive and important to you. Showing them that you’re giving them all these free resources because they’re in this private community will cause them to want to buy from you when the time comes. They trust you and are grateful for what you’ve provided so far. They know the value they get for free and will know the greater value of purchasing from you. Question: What advice would you give to millennials who want to quit their jobs and pursue something on their own? Answer: A lot of people’s passions will not give them financial security. So being careful not to pursue a passion, unless it’s a red hot, trendy way of making a lot of money, is important. So as a broad generalization, going after your passion isn’t always a good idea. But how does someone quit their job and go on to make money on their own? Some people shouldn’t because they think it’s easy and anyone can do it. The reality is, I struggled for the first couple years and I made less than what I was making before. Most people should stay at their job until they’re able to pay all your living expenses for one year. When their business is growing and doing well, they can go all in. Even with that being said, you’ll need to go out and invest in coaches, mentors, and advisors. Otherwise, you can’t tap into the community and the mindset behind being an entrepreneur. I would also read at least 50 books on the subject of your business from people who are currently doing it successfully. You can’t jump off a cliff without a parachute. So you need to be prepared and ready for the journey and the fight for success. Entrepreneurship is really rewarding but it’s a hard journey. People need to know that they can’t just quit their job and makes millions. It takes work! Are you subscribed to my High End Client Acquisition Podcast? If you’re not, I want to encourage you to do that today as I have a cool monthly giveaway going on. I don’t want you to miss an episode where you can win a lot cool things from books, courses, mentorship to even ipads, headphones and more. A bunch of episodes are added to the mix and if you’re not subscribed there’s a good chance you’ll miss out on any of those. Click here to subscribe in iTunes! I would be really grateful if you left me a review over on iTunes, during your entry in the giveaway. Those reviews help other entrepreneurs find my podcast and they’re also fun for me to go in an read and then give you a shout on IG, FB Live or Youtube. Just click here to review, select “Ratings and Reviews” and “Write a Review” and let me know what your favorite part of the podcast is. Thank you!